The Hunger Games meets the X-Men in an exciting postapocalyptic debut. But Jack and his friends--some of whom lost family on what has become known as Doomsday--know that the reality is very different. At great risk, they have been gathering evidence about what is really happening in London-and it is incredible. Because the handful of London's survivors are changing. Developing strange, fantastic powers. Evolving. Upon discovering that his mother is still alive inside London, Jack, his sister, and their three friends sneak into a city in ruins. Vast swathes have been bombed flat. Choppers cruise the streets looking for survivors to experiment upon. The toxic city is filled with wonders and dangers that will challenge Jack and his friends ... and perhaps kill them. But Jack knows that the truth must be revealed to the outside world or every survivor will die. Tim Lebbon is a New York Times-bestselling writer from South Wales. He has had over twenty novels, dozens of novellas, and hundreds of short stories published to date. Recent books include London Eye (Toxic City Book One), and The Map of Moments (coauthored with Christopher Golden). He has won four British Fantasy Awards, a Bram Stoker Award, and a Scribe Award, and has been a finalist for International Horror Guild, Shirley Jackson, and World Fantasy Awards. Fox 2000 recently acquired film rights to his book series The Secret Journeys of Jack London, and Tim and Christopher Golden have delivered the screenplay. Visit Tim online at www.timlebbon.net and on Twitter @timlebbon. "This is the first title in what promises to be a gripping series depicting a near-future England in the throes of a postapocalyptic disaster. Lebbon tells a grim tale, made a bit lighter by the well-developed friendship among the teens and the devoted relationship between Jack and his sister." "An inventive read that will entice readers of all ages." "Fans of The Hunger Games should enjoy this book as well…"
"Readers really come to inhabit Lebbon's destroyed, scary world. A great read." "A straightforward adventure narrative, moving from the relative safety of suburban life to the dangerous streets of London, with plenty of gunfights, showdowns, and daring escapes to keep readers turning the pages." 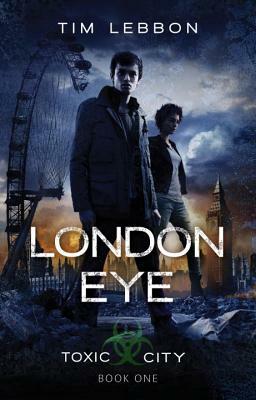 "If you've got a YA reader who is looking for a good action adventure with a solid dose of mystery and mutations, they're sure to enjoy London Eye." "A fascinating story....[Lebbon] creates a stellar cast of characters…complex and relatable throughout the book. The plot unfolds at a nice pace and keeps the reader engaged throughout the whole story. This is a great new series for fans of fantasy."